My previous post (Corrosion Article) discussed corrosion of underwater metals caused by various stray electric currents in the water. 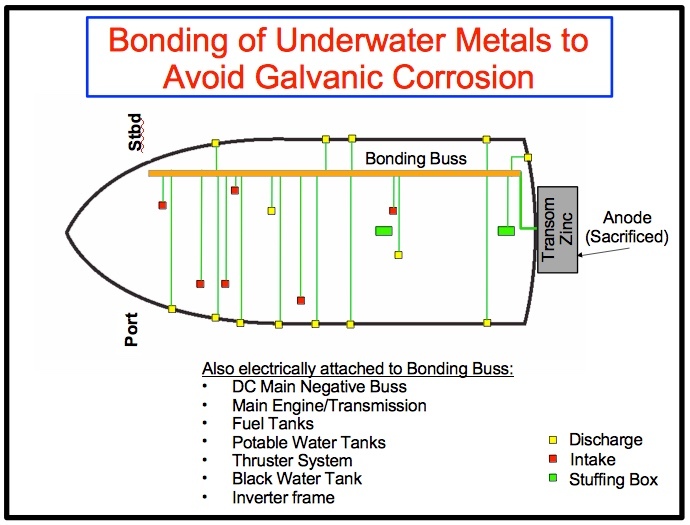 In that post, I made passing reference to “bonding,” “bonding conductors,” and to underwater metals “being bonded together.” This article looks specifically at the bonding system of a boat. The objective is to provide a basic understanding of why bonding is installed, what it does, and consider the maintenance needs of the bonding system. As in other electrical technical areas, “bonding” is an area where there is a body of common concepts and terminology that apply across a wide range of AC and DC situations. Just as in the “Corrosion” topic, the concepts of bonding are consistently the same, but an understanding of context is essential to avoiding confusion. Experienced electrical practitioners often take shortcuts with context. For the layman, the only way to get past that is to invest some time in understanding the concepts. After that, understanding context gets easier very quickly. provides a path for galvanic currents and AC and DC stray currents. Figure 1 is a simplified topology overview of the three major divisions (AC division, DC division and Bonding division) of the electrical system of a typical boat. It is representative of the great majority of US-manufactured boats. This topology view is consistent with the “model” electrical system upon which the principal ABYC Electrical Standard, E-11, is based (“AC and DC Electrical Systems on Boats,” July, 2015, Figure 10). The ABYC E-11 standard treats a boat’s DC System as the “central-most” division of the electrical system of the boat, to which all other divisions are attached in a peer-to-peer relationship. This seems a reasonable assumption, since AC systems and bonding systems are neither required nor essential on a boat, but the DC system is always needed for engine starting and the operation of bilge pumps, navigation lighting and (usually) sound-signaling device requirements. Figure 1: The Bonding System on a Typical Fiberglass (FRP) Cruiser. All of the conductors shown in green in Figure 1 are part of the boat’s “bonding system,” or “bonding network.” That entire network of conductors works together. In typical dockside conversation, the “bonding system” is often thought of as limited to the wiring shown on the right-had side of Figure 1. The usual term applied to the AC portion of the bonding system is the “AC safety ground.” Note, however, that the AC safety ground is a part of the overall bonding network of the boat. In normal operation, all bonding systems are “silent” and “invisible.” When “everything is right,” the bonding system does nothing, and “everything works fine.” Bonding networks are so quiet and invisible that a boat owner might never know if a fault had appeared. In fact, the primary purpose of the bonding system is to spring into action to protect us when an electrical fault does occur in either the AC or DC system. The only “normally active” purpose of the bonding system is to control corrosion due to DC galvanic currents. Due to component reliability, the mathematical probability, confirmed by life experience, is that electrical faults are relatively infrequent. Given that the bonding system comes into play only when there is a fault, it probably won’t actually be needed very often. If the bonding system does have a defect, unless there is another fault there will be no failure symptom or danger to people or pets. Yes, there may be an increased rate of corrosion, often interpreted as “electrical issues in the basin and nothing to worry about.” These are “handled” as a routine maintenance item, but the underlying cause is often not corrected. The bonding system adds complexity to the boat, but can save many headaches, much expense and even heartache for the boat owner if it is intact when needed. Some bonding system faults can create dangerous situations leading to fire, electric shock, loss of property and in the ectreme, loss of life. The heart of the DC division of the boat electrical system is the battery/battery bank, including all B+ and B- wiring and all subordinate DC device attachment wiring. “B+” is the term for the DC positive feed (+12V, +24V) that originates at the positive post of the boat’s battery. “B-” is the term for the DC negative conductor that returns DC power to the negative post of the battery. In the common lexicon of conversation, the DC return circuit is often referenced as its “ground” conductor. However, the B- conductor in the DC system carries DC current back to the battery, so it is more properly analogous to the “neutral” conductor of the AC division. Neither ABYC nor NMMA “require” the installation of DC bonding systems. Bonding systems are “optional.” However, ABYC E-11 does specify requirements for the bonding system if one is installed. Among US boat manufacturers, bonding systems are the “normal” manufacturing practice. reduce (attenuate) spurious RF electrical “noise” created by on-board equipment (battery chargers, inverters). In short, lots ‘o stuff. Figure 2 shows the hull penetrations on a typical trawler (Sanctuary) built with individual thruhulls (without a seachest). The complete collection of all of these metal components are “bonded” – connected together into a single electrical network – as shown in Figure 3. Figure 3 is only one example of the construction of a bonding system. Other configurations are acceptable. Take particular note of the large gauge conductor shown in orange. That conductor is the “backbone” of the DC portion of the bonding system. That backbone conductor runs the length of the hull. To the backbone are attached all of the green stranded wire pigtails connecting the metal structures of the boat to the backbone. Also note the transom zinc, which provides primary galvanic protection to all of the metals connected to the bonding system. When the boat is at anchor, away from shore power, it is the transom zinc that is the “ground” connection point. That is, the single point of electrical attachment to the earth, the primary dispersal point for static electricity and lightening and the electrical connection that establishes the “touch potential” for people and pets for the entire electrical system of the boat. It would not be unusual if a boat’s owner did not know when the bonding network was last tested. It may have been quite some time; perhaps, never. It is possible that weakness(es) are present in the bonding system. I suggest testing of the bonding system should be done every three to five years. In this “typical” battery, a galvanic cell, there are two “half-cells” (copper and zinc) located in an electrolyte. Since the battery is always seen as a packaged unit, the term “half-cell” is not commonly used except by engineers and battery manufacturers. The terminal voltage is measured with a digital voltmeter. When a load is connected across the battery terminals, current flows. Key concept: batteries are used to provide the voltage needed for circuits. With batteries, their intended use means there should be a voltage between the positive and negative terminals. A direct short circuit across a battery is never desirable, as it will dramatically accelerate the rate at which the battery becomes exhausted. Inside a short circuited battery, the halfcells will become wasted (corroded) at an extremely fast rate, accompanied by the generation of heat and gasses. However, in the case of the “accidental” battery created by the electrochemistry of dissimilar metals in seawater, the whole point of the bonding system is to create an electrical short circuit across the various exposed terminals of that “battery.” Bonding creates a path for electrochemical galvanic currents to circulate. Bonding holds all of the metal surfaces at the same, safe touch voltage, but in so doing, bonding also ensures the presence of the conditions needed for corrosion to occur. That is the reason for the presence of the transom zinc in the bonding network. The transom zinc is the sacrificial anode that protects all of the important and more noble metals attached to the bonding backbone from corrosion. A Silver/Silver Chloride half-cell is the best reference cell with sea water (chemical symbol: Ag/AgCl) because it has known and stabile behavior characteristics. That is, the voltage that other metals will produce against a silver/silver chloride half cell are very consistent across a wide range of temperature and electrolyte salinity. Conceptually, measuring between the Ag/AgCl half-cell and the bonding network of the boat is the same as measuring the between the terminals of a conventional battery. The bonding system and the half-cell, immersed in sea water, become the battery being tested. The DVM measures the terminal voltage of that battery. As a boat owner, there are two ways to proceed with the testing of the bonding system. One is to hire an ABYC-Certified Corrosion Specialist. This analysis is a form of survey, although not all surveyors offer it as a service. Two is for owners to do it themselves. In the DIY case, one must obtain an Ag/AgCl half-cell, available from http://www.boatzincs.com and other Internet sources at a cost in the range of $140 – $150. DIYers will begin their testing by connecting the Ag/AgCl half-cell to the negative terminal of the DVM. Then lower the Ag/AgCl half-cell over the side into the water near the hull, to about the level of the boat’s running gear. The half-cell should not rest on the sea bed. The guiding principle here is, if the bonding system is fully intact and functional, all metals connected to the bonding system are expected to be at the same voltage. Probing any of the bonded metals with the DVM should produce the same voltage reading. If different voltages are noted, something is not right, and corrective action is advised. The bonding system of a boat – whether connected to shore power or not – should produce a reading on the DVM of between -400mV and -700mV. Knowing that the bonding system has all of its metal structures tied together, we therefore know all of the readings must be found at the same voltage. Wide variation of voltages between different metal objects. Damage or corrosion to connections within the bonding system. Most metal objects have consistent voltages except for one or two isolated objects, “here and there.” Loose, corroded, broken or missing bonding connections to the affected metal object(s). A collection of several metal objects measure one voltage, but that entire collection is different from the baseline voltage. Broken bonding buss somewhere along the length of the backbone. The baseline voltage is grossly different than expected (-400mV to -700mV). Stray DC electrolysis current in the bonding system. No reading occurs when the metal object is probed. Bonding connections absent. This entry was posted in Bonding System Design and Evaluation on 2017/04/24 by gilwellbear.